Signed Surrealist Painting of a Woman from Java (2011), "Women"
Inspired by the power of women, Javanese artist Yuli Kodo paints an evocative composition that will make a great conversation piece in your home. 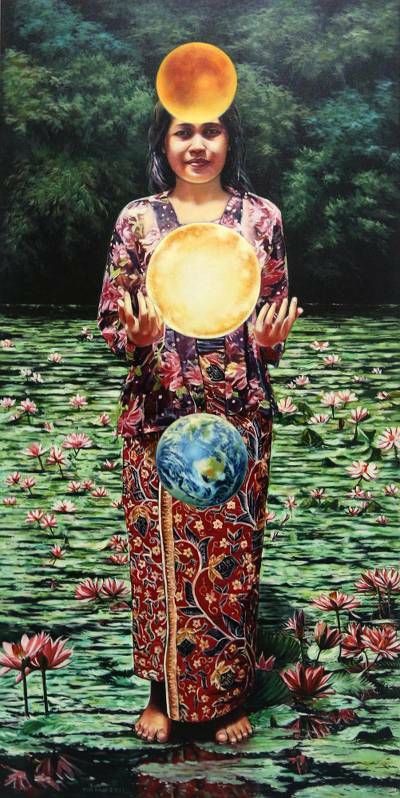 He paints an Indonesian woman in a realist style wearing traditional clothing, but she stands curiously atop a pads of lotus flowers. In this way, Yuli blends surrealist elements, painting the image of the sun, the earth, and an orange moon that float in front of his subject. Says the artist, "Women are a symbol of love, power, and the start of a new life." "I live my life by doing my best, with a happy heart and a smile." "I live my life by doing my best, with a happy heart and a smile. "My full name is Agus Yuliantara, but I am usually known as Yuli Kodo. I was born in the west side of Yogyakarta in 1968. Because my place of residence was close to the Yogyakarta Palace, I was used to seeing activities related with Javanese tradition, ceremonies, dance, music and batik. "Ever since I was a child, I played in the river, swimming while looking for fish. I also played in the fields, looking for birds, taking care of goats and simply playing with joy. Besides that, there were also my hobbies — making clay sculptures and painting on the ground. They led me to become a painter today. "I enrolled in a vocational high school in the arts then, at the age of 23, I started working in an art-related field. I designed and painted children's toys, and also spent time on my fine art paintings. "My hobby is traveling, visiting historical sites, temples and villages which eventually become inspiration for my paintings. I am married to my wife, Dwi Yanti, and we have three children — one son and two daughters. Children make me a real man, a father responsible for our family life. I am also responsible for providing a good education for my children and teaching them how to live a responsible and helpful life. "So far, I have received the Indonesia Art Award. I hope that, through Novica, my paintings with themes of Javanese culture can be known internationally."